What Is ItA stone lawn hippo in the grass. Why It's Today's PickAnother interesting find on a morning run. I had finished my run and was cooling down with a walk when I found the hippo. I thought he was cute but then I wondered how he might look through the grass. From this vantage point, I feel like it slightly recreated the tall grasses of the savanna, glimpsing a look at a hippo who just happened to notice me and is not happy about it. The lack of any color beyond the gray stone makes this fellow look rather menacing like I just interrupted him. Lawn ornaments are always curious things. We acquire them and throw them on out lawns and in our yards but what do we suggest or imply by displaying them? Does this person have an affinity for hippos? Was it just something to store a plant in (it looks like it's more of a plant holder) that they decided was cute enough for the front yard? What Is ItA turtle I ran into on my run this morning. What Is ItThe sun hiding behind a cloud this morning. Why It's Today's PickI had a couple good shots to share today so it was hard to just choose this one. My run this morning apparently was picturesque, which I certainly won't complain about. I snagged this shot while walking over the Salem-Beverly bridge. Beyond capturing the sun behind the cloud in such a cool way, I liked the photo for other reasons. The various levels of colors and clouds was diverse from the blue at the center to the grays and other colors in the bottom right corner. I also liked that while the sun was hidden behind the cloud, you could see it reflecting in the water in the background. Finally, the sun looks kind of like an eye to a strange cloud-create that is approaching a wall of clouds. I am, in no uncertain terms, a bull. I am broad, have legs like tree-trunks--whether fit from running or not--and will never fit into anything less than large (and even that is stretching it--literally). It is clear that my genetic predisposition set me up for brute--not skillful--labor. I've come to utterly appreciate that about myself and my body. Like I've said before, I'm more like a mule when it comes to physical prowess. What Is ItA frog hanging out in a frog pond at Long Hill in Beverly, MA. What Is ItA caterpillar-like insect hanging upside down on a branch. Why It's Today's PickYet again, I was on my way back from my run in the early morning and caught this guy out of the corner of my eye. I'd never seen anything like it--up close and personal. It was a strange fellow and of course, brought to mind a dozen science-fiction narratives about bug invaders. This fellow was about as long as my thumb and half as thick. It sat there like this, ignoring me as I played paparazzi to try to achieve the best picture possible. I recommend clicking through to the Flickr photo as you can see the rich (and funky) detail of its skin. Anyone know what kind of insect this is? I think I'll name him Frank. What Is ItA bookshelf of free books that the library has cycled out of its collection. What Is ItA house with it's back half made of brick and it's front half made of wood. What Is ItA quote on a window in a building at North Shore Community College. Why It's Today's PickI was in this building today--I'm not in it too often and I saw this quote on the window. I have no clue if it has been there since the building's inception (several years back now) or whether it is relatively new. But I liked it and found it rather appropriate for the gray and rainy day that we are having. The quote is "Water is life's matter and matrix, mother and medium. There is no life without water." 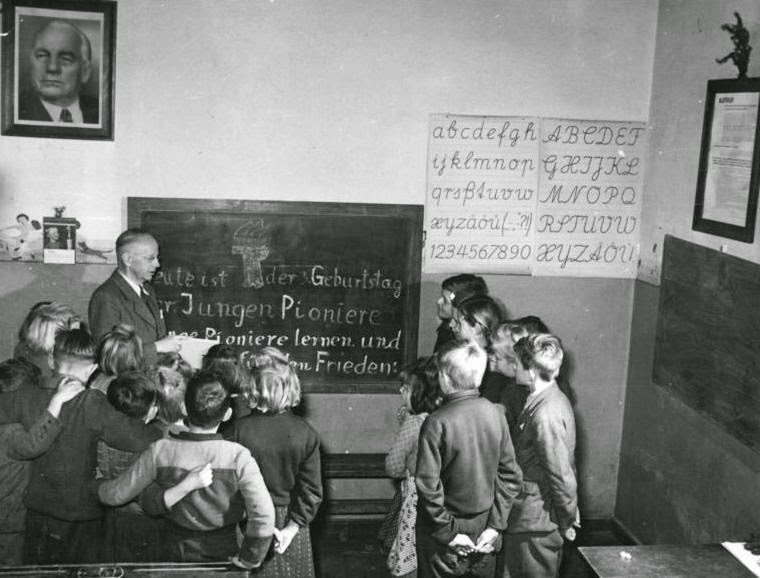 and is from Nobel Prize Winner (in Physiology), Albert Szent-Gyorgyi. I think we sometimes forget how essential water is because it is so disposable in a modern society and we forget how much effort it takes to keep our life-source clean and useful. It is a luxury still not accessible to many in the world. Why It's Today's PickWow--#20--only 32 more to go, right? I went with a straight on shot and skipped the running pic for the day. I maybe should have cropped this photo a bit more. I appear off-center. I probably should have accounted for shadow more. Oh well. My left-eye (right eye to the viewer) is definitely more haggard than my right. I blame this on allergies and the fact that they give my left eye more irritation than my right, but I'm clueless as to why. I'm also noticing that I'm having trouble reconciling my face since it lacks (much) facial hair and I've been pretty scruffy for a few months now. The things you notice (or don't) when trying to look yourself in the face, right? What Is ItMy car, Bear, taking a nap in her bed next to me. Why It's Today's PickI've included Pumpkin in several of my pics this year, but have not given Bear her own photo ops. Today, while pondering what to take a photo of, I looked next to me and there was Bear, napping peacefully. I knew I had my photo of the day. She generally likes to nap where her humans are. If we're not around, she will opt for different places--a bed, the window, and elsewhere. But if we're here, she's near us. At some point soon, she'll awake and do her stretching and then come over and give me a headbut. She's definitely the more alpha cat, but that doesn't stop her from wanting regular affection and staying near her humans. What Is ItA spider walking along the floor at the college. Why It's Today's PickI found this little fellow on the flow when I was walking up the stairs at work. I like the picture more for the aesthetics. The flash gave it a grayer look than it might have had otherwise. Also, you can't actually tell whether it is a floor or the wall The spider's presence of course changes how we look at the wall. No longer just a surface but a surface with something potentially sinister. I was glad that all the legs were visible and the spider itself came in so clearly. All in all, I like how this one turned out--especially because the 8 others that I took were all blurry! What Is ItThe sun peeking through some clouds in the early morning. Why It's Today's PickWhile taking my morning run, I snapped this photo when coming over the bridge. There were several versions of it depending on which angle or how much sky and water I had in the photo. However, I went with thsi because the sun's rays eminating from behind the cloud were most visible while you can also see the mixtures of reds and oranges in the smaller gap in the cloud. What Is ItPost race selfie. What Is ItA crab arm on the beach. Why It's Today's PickI was wandering on the beach this morning and stumbled upon this crab arm. It sat there lifeless and has probably been there for a while. In its curved state, I can still picture some crab attached to it, holding up its claw as it if was posing for a picture and flexing its biceps. I also found the range of color in in the arm impressive. I played with crabs as a kid but never really looked closely at one. The rich color of reds and beiges make it perfect for camouflage in the sandy environment in which it lives. But unfortunately, the owner of this arm is not likely among the living any more. What Is ItA screenshot of my final score on a recent marathon-length run on the game 2048. What Is ItA cupcake offered to me by a coworker. What Is ItA giant tree growing up next to the sidewalk. Why It's Today's PickAfter finishing my evening run, I was walking the neighborhood when I stumbled upon this fine fellow. This tree seems so wide that I doubted me and another person could wrap our hands around it. So beastly was it that the sidewalk curved around it, realizing it was a fight it could not win. It was curious to see the molds on the tree as I assume this is where branches had been removed, but the several strong arms of the tree were still impressive. I imagined that if I grew up in this neighborhood, I would definitely make climbing this tree a habit. Were I not tired from the run, I might have been tempted. We had a similar enormous tree on our street growing up but the shortest limbs were some twenty feet up. 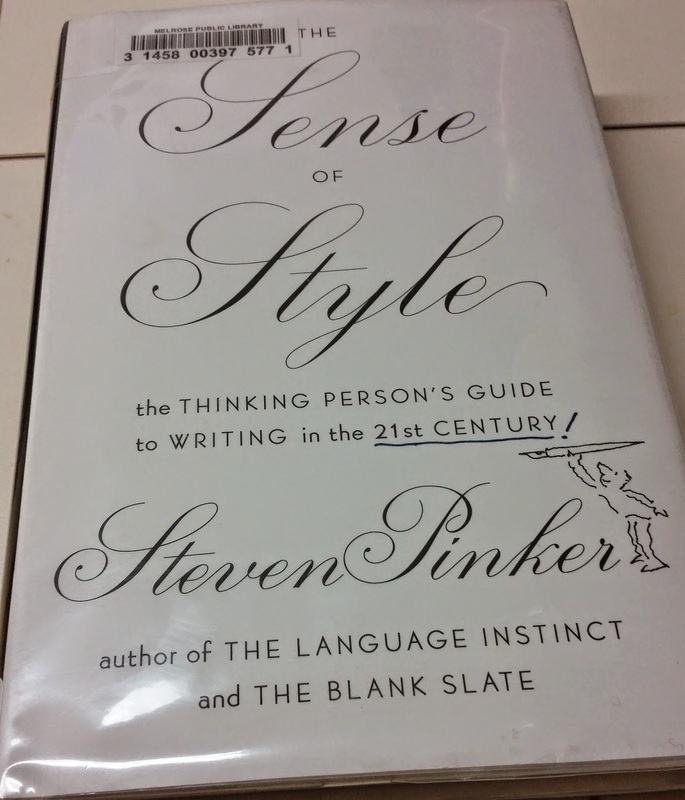 The Sense of Style: The Thinking Person's Guide to Writing in the 21st Century by Steven Pinker I heard much about Pinker's book when it came out last year and put it on my To-Read list. I've been a big fan of Pinker in general and his book, The Better Nature of Our Angels is still one of my all-time favorite books. I rather enjoyed this book too, in part, because Pinker is eloquent and clear. This style guide is something I'm likely to purchase and revisit as it really does layout some fundamental guidelines while simplifying writing and not being preachy. It's a must for anyone who wants to find better ways to improve his or her writing. What Is ItA blue flower growing on a stone pathway. Why It's Today's PickI've watched this fella in the entrance to the house for the last few days--surprised that no one has stepped up it. Like other flowers, one day it wasn't there and then one day it was. I have to wonder if there is purposeful caution by those who have came onto the porch and left to avoid the flower as it sits alone--far from the others of its kind that are within a quartered off area. That this flower has broken free and stands tall among in a flattened area that encourages foot traffic is a curious event. Yet, it still stands after days, waiting to bloom or to be crushed. What Is ItA selfie from me from the Beverly-Salem Bridge after finishing a 15 mile run. What Is ItA shopping cart in an inlet in Beverly. What Is ItA small tree that is starting to bloom with flowers. Why It's Today's PickI pass this tree almost every day going into work. It's small--maybe 5 feet tall with hunched over branches that reach out toward the ground instead of the sky. It reminds me in part of a willow tree but also as someone who walks about with slumped shoulders as if gravity had a stronger effect on them than everyone else--a friend of mine says that's what depression can often feel like. I've watched the tree slowly accumulate green the last few days but was amazed by the abundance of flowers blooming and visible pedals when I walked by it today. With those slowly opening, the tree now looks like a waterfall of flowers, rather than a sad slumping tree.